Today Japanese traditional culture in the form of Kimonos or Origami is well known in the world. What kind of “art” can you see in that kind of culture? I think it is the idea that changes a plain surface to an object with three dimensions. This time I would like to introduce one of my favourite items from Japanese culture, “Furoshiki,” which is a familiar and practical piece of cloth, and it contains hidden potential in regard to its various usages. The history of Furoshiki began in the Nara Period (710-794). At that time Furoshiki was used to store valuable things. It was the beginning of wrapping culture. In the Muromachi Period (1336-1573), Furoshiki was also used to wrap gifts and so various wrapping ways were created. At the same time aristocrats who used to go to public baths used Furoshiki to wrap up their clothes. In the Edo Period (1603-1868), public baths became more common to ordinary people and they also used Furoshiki as a bag in order to carry bathing items when they went to a Sento (public bath). Until the Meiji Period (1868-1912) Furoshiki was a common style of bag to wrap and carry in general. But from around the 1940s in the Showa Period, paper bags had become more common for use as a shopping bag. As a result, the usage of Furoshiki as a carrier bag has disappeared. However, even after its practical usage had disappeared, as well as the fact that the western type of carrier bag had become common, the usage of Furoshiki for wrapping gifts has remained. 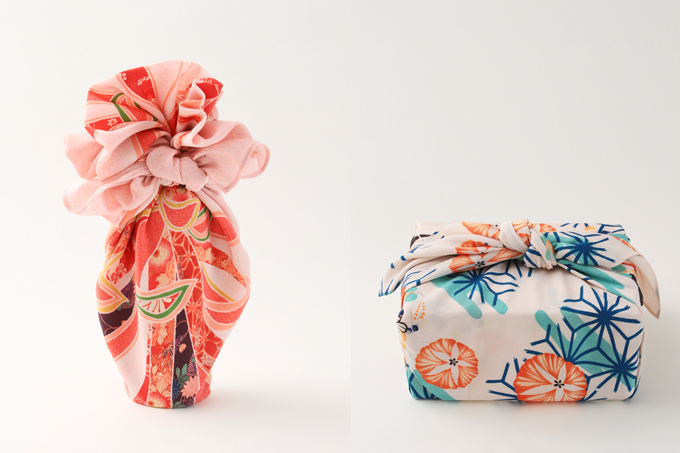 Today the popular image of Furoshiki is as a beautiful method for wrapping gifts. Today there is a great variety of ideas for wrapping gifts with Furoshiki. I would say that the creativity in using just a piece of cloth is in the same vein as the concepts of Kimono or Origami. 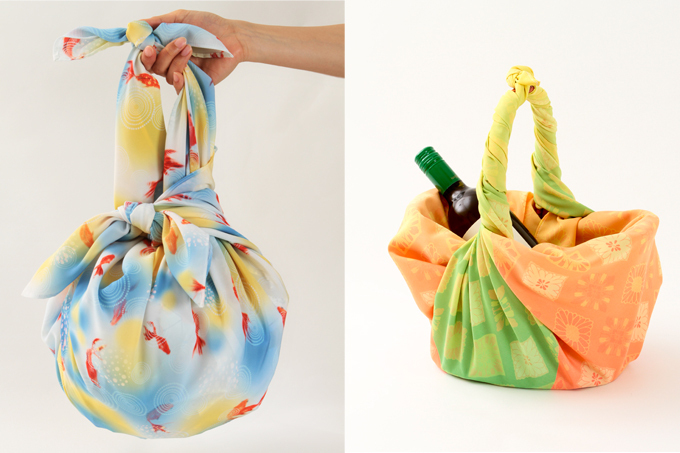 You may have seen wine bottles or a gift box beautifully wrapped with a Furoshiki. In addition, its lost utility as a carrier bag has now made a return as it is considered as eco-friendly alternative for use as a shopping bag. To use a piece of cloth as a bag we need ideas to make knots as well as think about its shape. There are already lots of ideas for the general public. People enjoy making a variety of Furoshiki shapes almost like Origami. 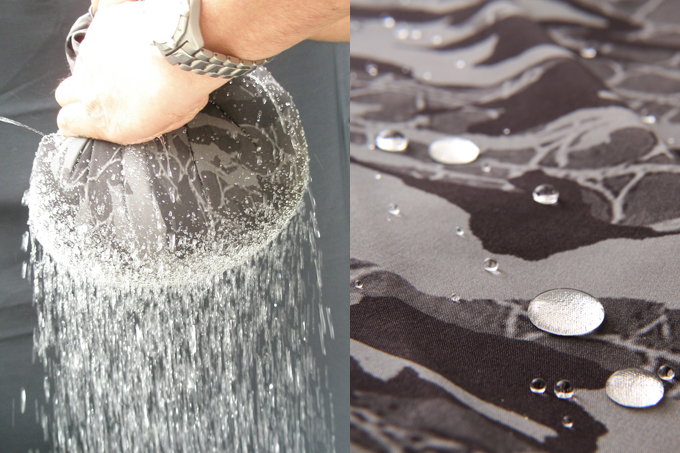 Also new materials and modern patterns are being produced to use as bags. It’s possible to not only enjoy using a Furoshiki bag practically but also enjoy its creativity. The next generation’s Furoshiki will definitely be successful just because of those two aspects. If you are interested in this concept, why not get a Furoshiki of your own in your favourite colour, and enjoy a variety of usages or discover your own idea for it.